It is festival time here in Brighton and Hove and so we are all very used to seeing strange sights in the streets. Well, stranger even than normal that is. But this guy surely takes the biscuit! 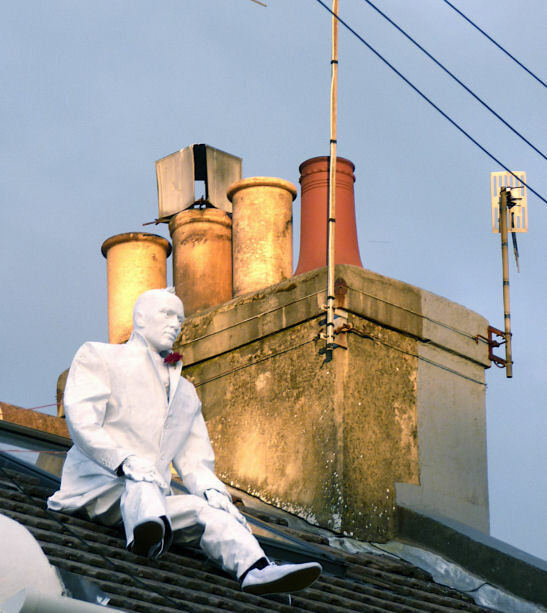 When walking down Gerard Street in Brighton, passers by have been struck by the sight of a man in a white tuxedo on the roof of number 30. When they readjust their eyesight, they can see that it is in fact not a rather eccentric roofer – but a dummy. The dummy, aka Chalky, belongs to the Beyond the Level, Artists Open House trail. Well he certainly is a novel way to advertise. So well done guys – best of luck with the festival.